The United States will impose a fresh round of sanctions on Iran next week, which the Trump administration says are the toughest penalties ever to be placed on the country. President Donald Trump’s withdrawal from the 2015 Iran nuclear deal in May meant previously lifted financial penalties will go back into force. The first tranche on August 7 targeted Iran’s ability to purchase or acquire US dollar banknotes, trade in gold and precious metals, and make transactions related to the Iranian rial, the country’s currency. But Sunday’s sanctions will primarily levy fines on Iran’s oil exports, as well as the country’s shipping and banking sectors — all incredibly important to Tehran’s economic health. The US will add 700 individuals and companies to a list of blocked entities, 400 of which were not originally sanctioned before the Iran nuclear deal. The main targets include individuals, aircraft, vessels, and organizations tied to the energy sector. Anyone who violates the sanctions by doing business with the entities on the list may lose access to the global banking system known as SWIFT (Society for Worldwide Interbank Financial Telecommunication), which banks use to conduct international transactions. If SWIFT authorizes moves between sanctioned entities, the United States may sanction the system itself. Iran is only allowed to use the revenue it receives from its oil exports for humanitarian purposes. That means the cash can’t go toward funding proxies around the Middle East or toward supporting Syrian President Bashar al-Assad in the country’s civil war, for example. Pompeo and Mnuchin said more specific information will be revealed on Monday once the sanctions are in place. US Secretary of State Mike Pompeo and US Treasury Secretary Steven Mnuchin speak with Mexican President-elect Andrés Manuel López Obrador at his party’s headquarters in Mexico City, on July 13, 2018. The move will certainly increase tensions with Iran, but it may also hurt America’s relationship with European allies. Many wanted the US to remain in the nuclear agreement but also to keep buying Iranian oil. Questions remain as to whether Europe will try to evade US sanctions by creating a separate entity to keep importing Tehran’s crude, though Mnuchin said the US would aggressively respond to such a development if it happens. Pompeo said eight “jurisdictions” will receive exceptions from punishments over the next few weeks because they had already significantly reduced their Iranian oil imports. It’s unclear exactly what Pompeo meant, but Bloomberg reported on Friday morning before the call that eight countries would receive the exceptions. Put together, the Trump administration has one clear goal: to increasingly punish Iran until it changes its behavior. “We are sending a very clear message with this maximum pressure campaign — we plan to aggressively enforce our sanctions,” Mnuchin said. The administration hopes the sanctions will compel Iran to negotiate a new, better nuclear deal and force Tehran to act less aggressively in the Middle East. Experts say that may not work. “The Iranians may be prepared to negotiate in principle, but they don’t trust the Trump administration,” Richard Nephew, who oversaw sanctions policy at the State Department during the Obama administration, told me. “They think that the US doesn’t intend to negotiate in good faith due to the presence of committed regime changers in the administration,” he continued. And Ali Vaez, an Iran expert at the International Crisis Group, released a report on Friday that shows Tehran has rarely changed its behavior in response to financial pressure. Instead, “the extent to which the Islamic Republic feels threatened or senses opportunity in its neighborhood largely defines its conduct,” Vaez concluded. In other words, the Trump administration will likely be disappointed by Iran’s response to increased sanctions. There’s no question that Tehran is suffering due to Trump’s reimposed penalties. Its currency hit record lows over the summer, and its oil exports to once-reliable customers are dwindling — all ahead of Monday’s sanctions. The measures have hit regular Iranian citizens very hard, in part because they target food, medicine, and parts to make civil aviation safer. In October, a top UN court told the US it must lift those sanctions, but it’s unlikely to do so. 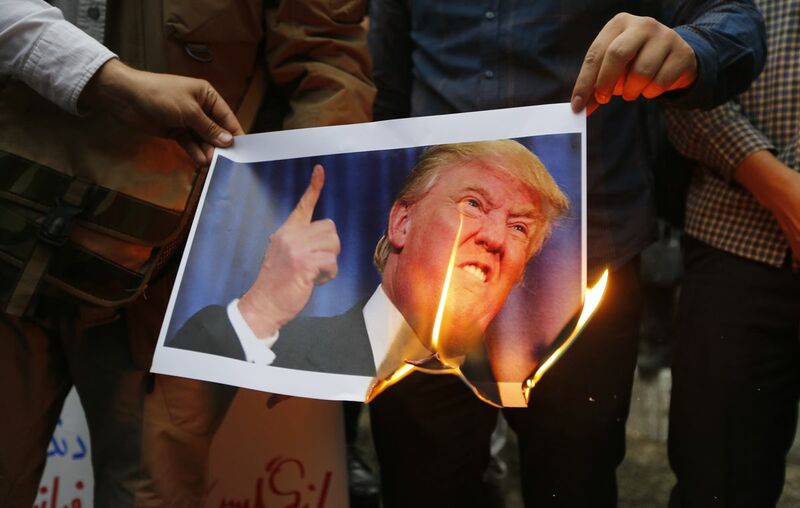 Iranians burn an image of US President Donald Trump during an anti-US demonstration outside the former US embassy headquarters in the capital, Tehran, on May 9, 2018. In fact, some Republicans, including Trump allies, believe the administration must get even tougher with Tehran. Officials inside the White House, like National Security Adviser John Bolton, were reportedly angered by the decision not to make the sanctions harsher and chose not to join Pompeo and Mnuchin for the press call over it. In the coming weeks, Sen. Ted Cruz (R-TX) will introduce legislation to cut Iran off from the global banking network SWIFT. Mnuchin has so far pushed back on efforts to do that. But that means it’s more than possible that Monday’s sanctions will be the start of a much harder-line stance on Iran — not the end.